In keeping with our custom of publishing the direct download links for major Adobe products such as Creative Cloud, CS6, Lightroom 6/CC, and Acrobat DC, below you’ll find the direct links from Adobe’s servers for the free trials of the new releases of Photoshop Elements 13 and Premiere Elements 13, for both Windows and Mac OS. With the links provided below, you can use your own browser’s download capability (without DLM), or another download manager of your choice. For setting up PSE 13 and/or PRE 13 on Windows, each program consists of two down­loaded files: an .exe and a 7-Zip file (.7z). The .exe file will only work (and install) once the .7z file is fully down­loaded and resides in the same folder. For the Mac, it’s just a single .dmg file for each program. In order to properly run Photoshop & Premiere Elements 13, your computer must meet Adobe’s minimum system requirements for the products. See below for what’s new & different in this release. You must have a free Adobe account and be logged into it to use the links below, as Adobe sets a session cookie on your browser that allows you to access the direct download links. Otherwise, you will receive an “access denied” or “no permission” message block­ing the connection. So please follow these instructions carefully or the links will not work! Click «HERE» to visit this page first, before clicking any of the links below – this is critical! Photoshop Elements now comes in both 32-bit and 64-bit versions for Windows… 64-bit offers higher perfor­mance but choose the 32-bit flavor if you’re unsure what your system is. Premiere Elements comes in both 32-bit and 64-bit versions… 64-bit offers higher perfor­mance but choose the 32-bit flavor if you’re unsure what your Windows system is. Product languages supported: The Elements 13 tryout versions are currently available in English, French, German, Japanese, Chinese, Czech, Dutch, Italian, Korean, Polish, Portuguese, Russian, Spanish, Swedish, or Turkish. Adobe has not released new “Bonus Content” for Premiere Elements 13, but the Additional Content for PRE 10 (containing InstantMovie themes, title templates, DVD/Blu-ray menu templates, and music to enhance movies you create) should continue to work with version 13. You do not need to uninstall previous versions of Elements; some users prefer to keep the older, familiar version(s) around as they come up to speed with the new version’s features. Install with an account that has administrative privileges (not a Limited User Account if you are using Windows). For the easiest installation experience, quit any open programs, including virus protection software, prior to installing Elements 13. 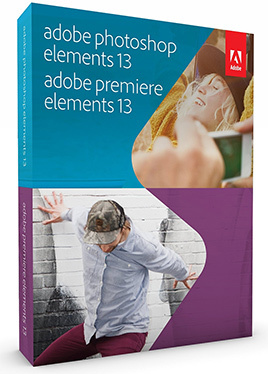 Read the accompanying Photoshop Elements 13 Release Notes in English, French, or German. If you run into any difficulties, see the Elements 13 Installation Troubleshooting page. What’s New in Elements 13 – What Features Have Been Added? Choose your favorite clip moments and Elements turns them into a movie — done! For more details, see this comparison chart of the differences between Photoshop/Premiere Elements 13 vs. Elements 12 vs. Elements 11… Adobe has also published new/enhanced feature reviews for PSE 13 as well as for PRE 13, showing what’s changed. If you own almost any earlier version of either or both tools, then you would probably qualify for upgrade pricing. I bought elements 13 six months ago from BestBuy and wanted to install in an Apple computer. After I got my new apple computer, I found it was very hard for me to use it (I have used a PC for over 25 years, and have never used an apple computer). I am afraid if I install the elements 13 on this computer and could not really use it, I may just waste it. So, until now I have not installed it yet. I wonder if this version of Elements 13 (CSGN) can be installed on both an Mac OS apple computer and a Windows PC computer? If so, I will try to use it on my apple computer. In case it does not work out, I will install it on my old windows computer. Hi. I just upgraded to Windows 10 from windows 7. My Photoshop Elements 10 worked perfectly on windows 7, but now it won’t allow me to photoshop any of my pictures. Hello Rene, could you please give more details on the exact problem you’re encountering? When you say, “it won’t allow me” – what steps do you take, and what happens exactly with the program? Did you receive any errors or other messages? Are Photoshop & Premiere Elements Compatible with Windows 10? I’m using Elements 9 just fine on Windows 10 but I had to uninstall then do a new clean install. Once I did that it worked just as it did on Win 7 and 8. Great, thanks for sharing that! I purchased elements 13 on a dvd, but it will not install from my dvd drive in windows 10 and there is no setup.exe file on the dvd for a manual installation. What are my options? Can I download elements 13 and use the serial number on the dvd box to register it? Yes Richard, you can absolutely do that here. These download as the free trial versions, but will activate to fully-licensed releases when you enter your valid purchased serial number. I just purchased Photoshop Elements 13 and it does not install from my disc on windows 10. There is no setup.exe file on the disc for manual installation. What are my options? How can I install Elements 13? We haven’t heard cases of it before, but it’s possible you received a defective disc. But no problem, as mentioned above you can use the downloads here instead. If you are unable to return/refund or exchange it for some reason, then you should be able to download and install the Elements 13 update by using the Help menu > Updates command. I bought Adobe photoshop elements 11 from the Apple shop and it worked perfectly until I upgraded my MAC OSX to El Capitan. The next time I wanted to use it a message telling me that it had been installed on a different computer and it required a password…which I did give. However it now opens and works fine but refuses to save anything and I have to force quit. I can guess what has happened here but how do I fix it..I have tried to reinstall from Apple shop as my download is still there but it still will not save. Not sure, but looking at Adobe’s Elements Operating System Compatibility Chart, it seems unlikely that Elements 11 is officially compatible with El Capitan… PSE 11 came out in 2012, predating Mac OS X 10.11 by several years – and Apple is notorious for poor application compatibility between different versions of their operating system. However, if you want to try or upgrade to the latest version (Photoshop Elements 14) then that is definitely supported, and you can download a free trial to check it out if you want. Hello Bella, unfortunately we can’t help you with the return of a store-bought product, but it’s surprising that they would even sell you an old version like that instead of the latest release, Photoshop Elements 14! For your purposes with line drawings, maybe Adobe Illustrator would better suit what you are trying to accomplish? What Is the Adobe CC Single-App Subscription? Does Photoshop Elements Work with Mac OS X v. 10.11 El Capitan? Did you buy your Elements 11 from the App Store? The reason that App Store versions are having problems is apparently because of bugs in El Capitan. And Adobe can’t fix bugs in Apple’s OS – only Apple can fix bugs in Apple’s OS. But software like PSE 14 purchased directly from Adobe.com should be fine. Can you provide direct download links for the Elements 13 updates? No, sorry – we don’t have those at this time. We do have the Elements 14 direct links, including all updates to date. elements 13, if you have the 64 bit system, the 32 bit DOES NOT WORK! you should note that. I tried 3 times to install the 32 bit version and got the same error message all three times, so if you’re running a 64 bit system, DO NOT USE THE 32 BIT DOWNLOAD! I have limited internet usage and downloading the 32 bit means now I have to wait a damn month to download the 64 bit. thanks a frigging lot. Haven’t heard that before. What error message did you get? If you know you have a 64-bit system, then going with the native 64-bit version of the software is going to give you better performance – so that’s definitely the way to go on Windows. the error message said, specifically, the 32 bit in non compatible with your system, please download the 64 bit version. I had pe 13 on a computer running windows 10. I got a new computer and reinstalled the download files. I recently had to reinstall windows and now I can’t reinstall pe 13. I get a pop-up saying that adobe has detected that the machine has a restart scheduled and to cancel and restart. I do this and get the same message so I click ignore and get to the sign in page. When I try to sign in. the sign in screen goes blank. Any suggestions on what I can do. And then reboot your computer and reinstall the software afterwards. Thanks for the quick reply. I’ll try that this evening and let you know how I get on. I got pe 13 downloaded. HP support assistant had a problem and when HP support fixed it I started getting various updates including the intel graphics card driver update and Windows 10 creator update. When all the updates were installed, Premiere elements installed with no problems. Thanks again for your help. Great, glad to hear you got it sorted out – and thanks for letting us know.